With the increasing uncertainty that we face in today’s world for so many things such as health, property, investments etc., the most sought after solutions have been insurances. This has led to the setup of many insurance agencies that provide life insurance, health insurance, property insurance and so on. There are many different types of plans that are available and tailored specifically for the needs of different individuals. Moreover, with greater uncertainty, there are greater risks involved for the insurance providers as well. It is hence very important to come up with plans that ensure that even if there is some bad happening, the insurance company is not on the losing side but is able to make some profit out of the scheme. 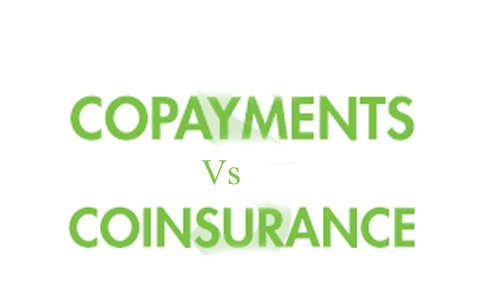 Two such important terminologies and phenomenon related with insurance are coinsurance and copay, which is short for copayment. Coinsurance is used to describe the spreading or splitting of risk involved in insurance among a number of parties so as to ensure that one person does not have to incur all the losses in the case of the worst happening. Taking the example of the US insurance market, coinsurance refers to the case when the risk is jointly assumed by the insurer and the insured or the sharing of risk is between two or more insurance companies. On the other hand, copayment is the fixed payment for a service that is covered. The payment is made when an individual receives the service. For example in the US, the payment that is defined in an insurance policy and is paid by a person who is insured every time the service the insurance promises is accessed is called the copayment. It has to be paid before any benefit of the policy is payable by the insurance company. In some cases, it is a form of coinsurance but is quite different when it comes to health insurances. An important difference between coinsurance and copayment is that the latter does not usually contribute towards any out of pocket maxima policy but coinsurance does contribute to the same. Let us also further elaborate on the difference between the two in health insurance. Coinsurance is defined as the percentage payment that is made after the deductible up to a certain limit. In contrast to this, copayment is fixed for health insurance. The coinsurance, which is a percentage of what the insurer pays is expressed as a pair of percentages; the first one being the one that the insurer has to pay followed by the percentage that the insured has to pay. In most of the cases, the maximum proportion that the insured will have to pay is no more than half. To explain the difference in very simple words, we will use an example. Firstly, it must be pointed out that no health insurance can be expected to pay 100% of your expenditures. The total expenditure is always divided between the insurer and the insured. However, the dividing mechanism varies in coinsurance and in copayment. So the question is that how much is the insured patient supposed to pay? In the case of coinsurance, it is a percentage, say 10-40% of the bill. In the case of copayment, however, it is a flat, fixed amount that the patient has to pay, such as $40. If your health plan has clauses stating a $35 copay for consultation, $10 copay for a prescription and a $200 copay for surgery then that is all you have to pay regardless of the total bill. On the other hand, if your coinsurance plan has a deductible of $800, then you have to pay the $800 in medical expenses and after that you will have to pay the percentage specified in the coinsurance clause. It can be said that copayment is better for huge bills whereas coinsurance is better for small bills. allana. "Difference between Coinsurance and Copay." DifferenceBetween.net. January 14, 2015 < http://www.differencebetween.net/business/difference-between-coinsurance-and-copay/ >.